As all moms do, before our first adventure I read up on how to keep a baby happy on an airplane. I worried about his ears and the pressure, and the possibility that he could scream the entire time causing the whole plane to hate me! But low and behold, once we boarded the flight and took off everything went smoothly. I fed him during take off and he fell right to sleep. He was the best little traveler we could ask for. Each flight was simple with Calvin. We would bring snacks he wasn’t used to eating to occupy his time and pack small toys he hadn’t seen in a while. 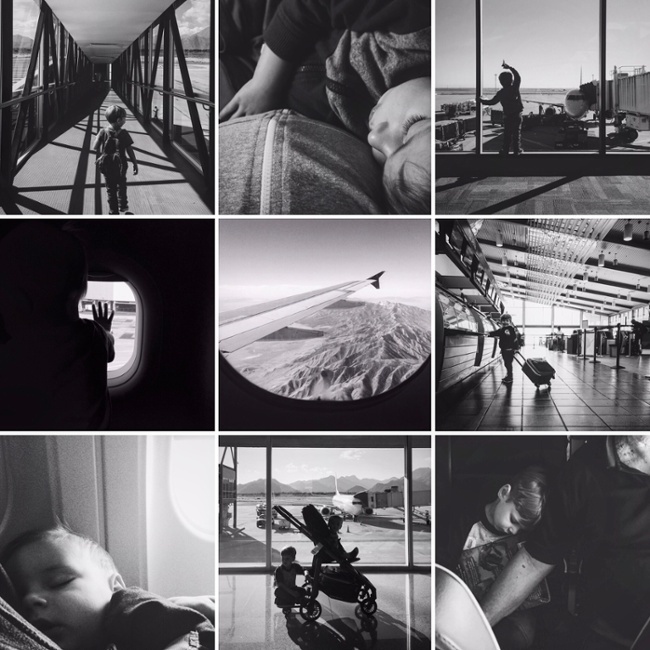 Airplane travel with one kid was, dare I say, easy for us. Calvin blessed us with being a pretty low maintenance baby. Fast forward to our family of four traveling on a plane…and all bets are off. Our second, Archie, is stubborn, loud and extremely opinionated. Although flights with him thus far have turned out ok, I leave the plane feeling like I’ve just been through a battle. Keeping him quiet and entertained while he is standing and climbing all over my lap is not my idea of a relaxing trip. 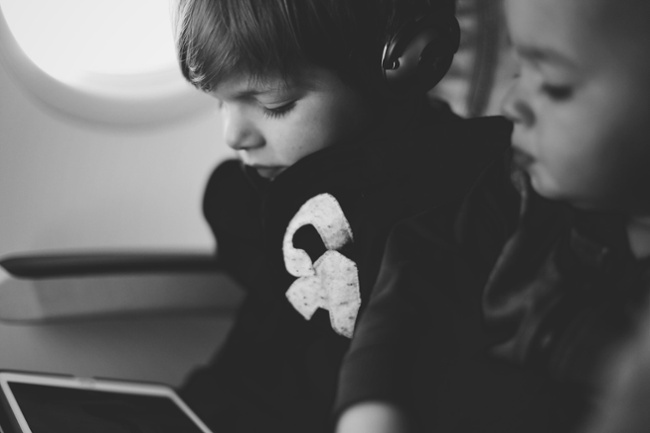 If you’re traveling with two or more kids, definitely do not have any plans to read, listen to, flip through, or watch anything yourself until they are older. We took a trip to Sedona with friends of ours when Archie was two months old. We made the same 12-hour road trip before with Calvin and it was great. Archie wasn’t going to make it as easy on us. He hated the car seat and screamed for much of the drive. Our car even broke down as we were heading home, adding an extra five hours to our trip. My husband and I looked at each other with defeat in our eyes. But, we made it through (barely) and believe it or not, had some great times along the way. We are proud that we tried it and we survived with a three year old and a two month old. Prior to kids, my husband and I talked about how important it was that having kids didn’t stop us from living. We knew it would be difficult, but we didn’t want kids to run our lives, we wanted to make them a part of ours. So we have continued to travel to places and so far, it has proven to be a lot of fun. It is harder than staying home and being in our safe zone, but we have found a groove and it has gotten much easier. We hope showing them so many things in life will help keep them well rounded and down to earth. It’s never as loud or as bad to everyone else as it seems to you. Be prepared to stay in front of their boredom– Boredom is the enemy. I’ve always tried to have the next game, toy, show or snack ready to pull out as soon as they show signs of boredom creeping up. 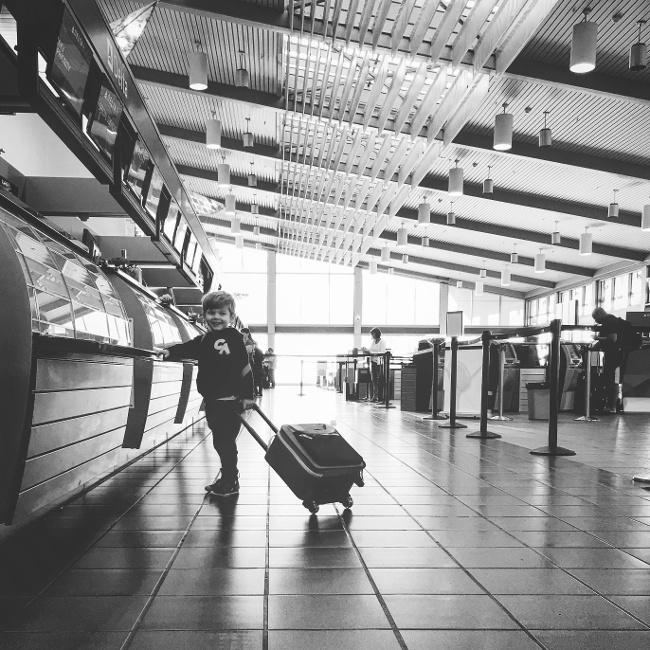 My final advice, whether you are going on a flight, road trip or just to the park around the corner, is traveling with toddlers should be simplified– quality not quantity. Bring only the essentials, try to anticipate the few things you may need (jackets, juice, sunscreen, etc. )…and don’t be afraid to take them to new places. It might be a disaster, but it also might be an amazing adventure.